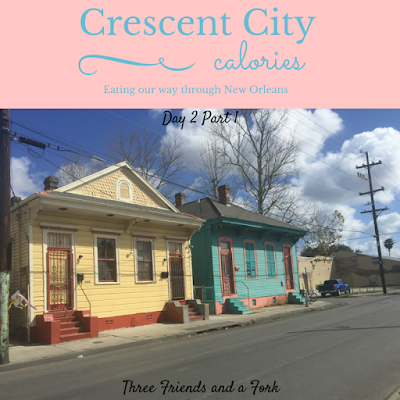 Our second full day in New Orleans began with a hike...literally a hike, as in we hiked our way across town. By the time the day was done, the heart app on my phone was groaning from the number of steps I had taken. I was really surprised alarms didn't go off. The main reason for all this walking was a restaurant Haley had found from watching Anthony Bourdain. We had no idea how far away it was from our hotel or we would surely have taken a taxi. We started out walking for breakfast, but we ended up arriving for lunch. The restaurant in question was called, Satsuma, and it lies in the Bywater area of the Upper 9th Ward, far away (at least by foot) from the tourists in the French Quarter. We walked through some sketchy areas, which I don't recommend. If you get a hankering for the fresh, organic offerings of Satsuma, grab a cab. On the plus side, we did get to see some interesting New Orleans architecture and I enjoyed looking at the shotgun houses along the way. We even passed by a home with a cornstalk fence similar to fences we've seen in the Garden District of New Orleans, as well as the one in Foley, Alabama. Satsuma, itself, has a totally hipster feel. Artists, poets, musicians, and bohemians looking for healthy green juices and a kale fix would be right at home in this quaint little joint. The decor and the menu both reflect this attitude. It looks a bit like your crazy, hippie cousin, Moon Child, inherited old aunt, Agnes' house and funked it up with a colorful coat of paint while hanging on to all the dusty old relics. Upon entering the cafe, visitors approach the register to make their selections and place orders. There was a line when we walked in, but it was just the right size because it gave us time to study the chalkboard menu and make our selections. For a small place, there were quite a few choices. So, what did we choose? Well, I got a salmon melt with some of my favorite things...capers, red onions, dill aioli, celery, tomatoes and swiss, all piled up on toasted sourdough bread. It was delish! I swear, by now you guys could probably order for me. I am so predictable! I also had a cranberry, poppyseed scone, which was yummy, as well. I was a little skeptical of the "healthy" drinks. I've been burned a time or two and gotten something that sounded good and healthy, but tasted like quinine, so I carefully asked about the drink situation before I ordered. The lemonade I ended up with was perfect. Haley went with a coconutty muffin and a turkey sandwich with pesto aioli, roasted red peppers, arugula and provolone on ciabatta. She got some kind of iced coffee to drink, which she proclaimed her best coffee in New Orleans. She was pretty happy with her selections. Ayla, the breakfast girl, ordered a cinnamon pecan pancake and a bacon, egg and cheese biscuit. I am not much of a breakfast girl, at least not in the traditional sense. I eat breakfast, but you should not be surprised to see me eating spaghetti or chips and salsa for my first meal of the day. I have to say, I thought Ayla made the best choices on this day. Her pancake and the biscuit were both delicious. Fully stuffed and groaning, we left Satsuma's and dreaded our hike back to town, because now we knew just how far we had to walk. We had things to do, however, so off we went, taking a different (better) route back to the French Quarter. I told you it was a hipster neighborhood. Even the puppies have swag! as we made our way to, you won't believe this, The Audubon Insectarium. No, I am not joking. I went to New Orleans and looked at bugs. There are two reasons I was okay with this. First, I was exhausted from all the walking and burning up from the heat and humidity, so anyplace with air conditioning looked really good to me at this point. Second, one of the reasons Haley wanted to go to the Insectarium, was to belly up to the bug bar and scarf down a few creepy crawlies. I knew I didn't want to miss watching the girls eat bugs. And, no, I was having no part of this. I am very particular about wasting calories. Haley and Ayla dined on cricket cookies, grub worm chutney, wax worm salsa and chocolate ants. It was truly as disgusting as it sounds and the green looks on their faces when they finished told me I had made the right decision, no matter how cheerful and convincing the little bug chef tried to be. I did, however enjoy our stroll through the butterfly exhibit as we were exiting the building. This is my version of the Insectarium and I am sticking to it. You can check out Haley's version, at life-n-b-tween.blogspot.com. We'll catch up on the rest of day two in the Crescent City later. Until then, we are giving Satsuma Cafe 3 Healthy Yums UP. I can't judge the bugs because I didn't eat them.